The photo shows 2 athletic young men, 2 children and me, a plump old lady, pedaling east across Stockton Drive, a tree-lined street that sidewinds Chicago’s Lincoln Park Zoo. 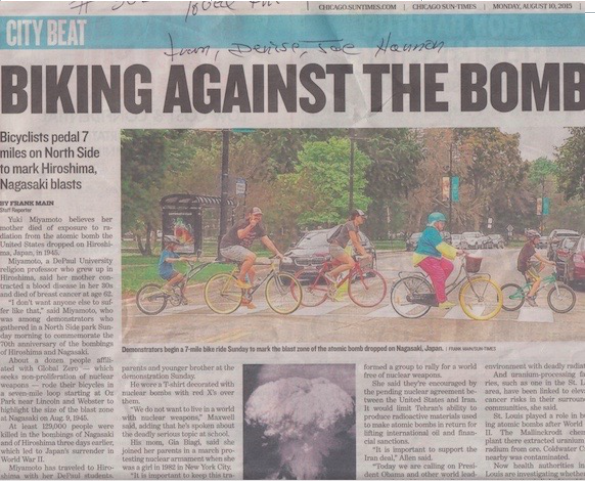 The photo appeared in the City Beat section of the Chicago Tribune August 10, 2015 with the headline, “Biking Against the Bomb.” The caption reads “Demonstrators begin a 7-mile bike ride Sunday to mark the blast zone of the atomic bomb dropped on Nagasaki, Japan.” My bike has a big yellow front tire, a black whitewall rear tire and red basket. I’m sporting neon pink ankle-length trousers, lime-green sneakers, and a “Bike Around the Bomb” extra-large short-sleeve turquoise t-shirt snugly over my long-sleeve lemon shirt. The t-shirt just happens to be the same color as my helmet and eyeglasses. My bike posture befits a 69-year old short grandmother with bulging thighs and donut midriff. I stand out in the photo. You see my hands gripping the handlebars of my beloved town bike. What you don’t see is God caressing those hands with high-fives. The day this photo was taken, that bicycle grace relieved me of the physical pain of moral certitude. When I was in my 50’s, I worked in downtown Chicago overlooking the Daley Center. Every month a group of bicyclists, Critical Mass, gather in the plaza before their raucous ride through city streets. How I longed to join them! But I’d been derailed from lifelong bike-riding by fibromyalgia. After I retired I downshifted into wheelchair-bound despondency. Suicidal thoughts took me to the velodrome of alternative therapies. Round and round I went to anyone, anything that might relieve my suffering mind-body. Eventually meditation led to feldenkrais, writing therapy, pain relief, and a bicycle. I’ve marched in peace demonstrations since the 1960’s so “Biking Against the Bomb” was the perfect foray into group cycling since I regained mobility. Educated by nuns, I learned about peace huddled under my 1st-grade desk hiding from a possible atomic bomb. Pray for peace. God required peace by every means possible. President Truman had written his own moral code a year before I was born. In August, 1945 he murdered 180,000 Japanese civilians with atomic bombs. An unnamed fear took root in my fetal shroud and sprouted in the dappled shade of A-bomb-talk throughout my youth. This genetic consequence chained me to the spokes of peace activism. I went home, opened my computer, defaulted to moral certitude and clicked “going” on the next Critical Mass event listed on FaceBook.